Can I REALLY become a soccer mom?? That's right! Paul is taking a soccer class! 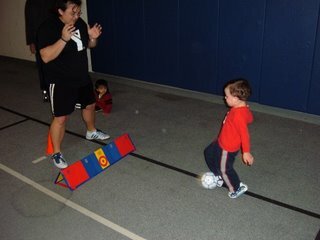 It is an instructional class at the Y teaching 2 1/2 and 3 year olds the basics of soccer. Too bad I don't know the first thing about soccer. I did get out of the class from the instructor "THE BALL STAYS ON THE GROUND!" Paul did wonderfully. 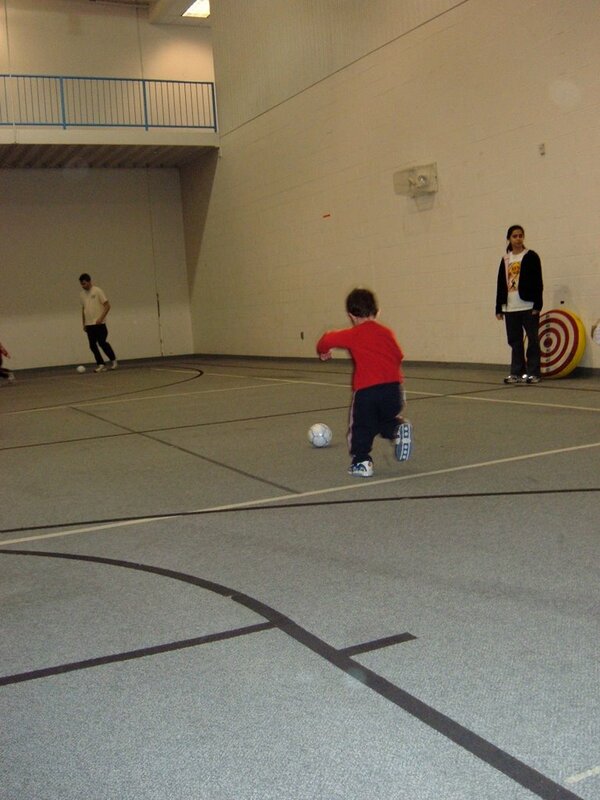 He does a great job kicking the ball across the room. He has a ton more coordination then his mommy. His buddy Josh is in the class with him so that made it extra fun. The best part is we went out to breakfast after the class. This soccer thing isn't soo bad afterall. Aside from Paul taking his class, I decided WW (affectionately called FAT CAMP) was not enough for me any longer. So, this past week I started water aerobics. I only have one question: am I supposed to hurt three days later???? I could barely walk for the next two days after class!!! It will be good for me. I need to exericise if I ever think I am going to walk any of the Great Wall of China. On that home front, No news... referrals should be coming soon. We just pray that we get half way through June. We did go to dinner with some FTIA travel buddies tonight. As always it was a lot of fun. Bob and Paul had "good fortunes" in their cookies. Bob's said: "The Coming Month shall bring winds of change in your life." Paul's said: "good things are coming to you in due course of time." Mine: well it said something like I enjoy night life. Well that is true... and we are having a girls night next week. So maybe the other two will come true as well!!! Well, tonight is short, sweet and to the point. have a wonderful night. And sweet dreams of referrals in the mail! Posted at 7:53 PM by The Belanich's. watch what you say to a 2 1/2 year old! Lady Bugs and Thinking Pink!